What are bioresorbable polymer implants? Bioresorbable polymer implants are made from essentially the same lactic acid molecular building blocks that occur naturally in the human body. (Lactic acid is produced in the muscle during strenuous activity.) 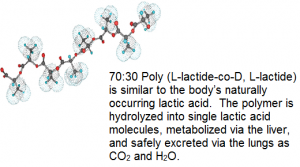 Long molecular polymer chains are created by combining lactic acid derivatives known as lactides. The resulting polymers are generally referred to as polylactides or PLA. MAST Biosurgery implants, used for soft tissue applications, are made from Polylactide: a copolymer of 70:30 Poly(L-lactide-co-D,L-lactide). How are bioresorbable implants used? Bioresorbable implants are used for applications in treating diseases, deformities, trauma, and a variety of soft tissue procedures. Bioresorbable thin sheets are used for the support of weakened soft tissues, with clinical applications across multiple surgical specialties. How do bioresorbable implants resorb? The copolymer maintains its strength during the healing process, and through hydrolysis slowly breaks down into lactic acid molecules. The resorption process occurs in two phases: (1) H2O (water) penetrates the implant, reacts with the polymer and breaks the polymer chains (hydrolysis); (2) hydrolysis converts the long chains into shorter chains until the polymer fragments into single lactic acid molecules. 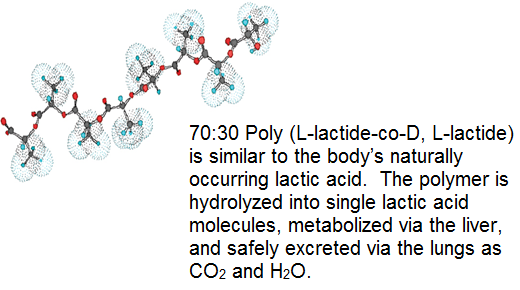 Lactic acid molecules are then metabolized by the liver into CO2 and H2O and released through the lungs. How do bioresorbable implants compare to metal implants? Bioresorbable implants, made from molecules similar to those in the human body, resorb after the tissue is healed. Permanent metal or nonresorbable implants remain in the body after healing takes place, unless they are surgically removed. Bioresorbable polymer materials offer application versatility – they can be designed for hard (bone) and soft tissues. Additionally, bioresorbable implants do not obscure radiographs or MRI/CT scans, which allows for more accurate evaluation during the healing process. Patients benefit from these contributing factors. How long have bioresorbable polymer materials been used in implants? Bioresorbable polymer sutures have been used in patients for over 40 years. Technological advancements have facilitated the production of the wide variety of bioresorbable polymer implants we have today. How long have bioresorbable polymer sheets been used? Although resorbable polymers have been used as suture material in patients for nearly 40 years, bioresorbable surgical mesh has been around since the 1980s. Polylactides or PLA are the polymers that result from long molecular polymer chains created by combining lactic acid derivatives, known as lactides. How do scientists choose the ideal materials for bioresorbable polymer implants? The most important factor is that bioresorbable sheet materials degrade in the body safely and are naturally metabolized. Material scientists examine mechanical, physical, and biological attributes of the material. In general, scientists look at the molecular structures to determine which are similar to those in the human body and can be safely resorbed and metabolized. MAST Biosurgery implants, made exclusively from polymer materials, fit these criteria. How are bioresorbable polymer implants made? MAST Biosurgery designs, develops, and manufactures its implants through proprietary technology. All bioresorbable polymers and implants are validated through extensive safety and efficacy testing. Industry-wide testing standards include protocols for tension, compression, bending, aging, and resorption characteristics. Sterilization methods commonly used in the medical device industry are electron beam (E-beam), gamma irradiation, or ethylene oxide (ETO).